The 4th BIMSTEC Summit concluded in Kathmandu with signing and adoption of Kathmandu Declaration by all the seven members (India, Nepal, Bangladesh, Bhutan, Sri Lanka, Myanmar and Thailand). 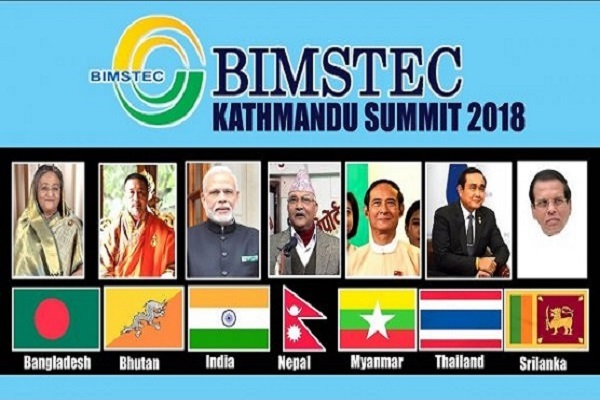 18-point Kathmandu Declaration aims to enhance effectiveness of BIMSTEC Secretariat by engaging it in various technical and economic activities in the region. It acknowledges importance of trade and investment as one of major contributing factors for fostering economic and social development in the region. It also deplored terrorist attacks in all parts of the world, including in BIMSTEC countries, and strongly condemned terrorism in all its forms. It also reiterated strong commitment of BIMSTEC countries to combat terrorism and called upon all countries to devise comprehensive approach in this regard. Member countries also agreed to expedite conclusion of BIMSTEC Convention on Mutual Legal Assistance in Criminal Matters and called upon member states for its early ratification. It also expressed satisfaction that many member states have ratified BIMSTEC Convention on Cooperation in Combating International Terrorism, Transnational Organized Crime and Illicit Drug Trafficking. BIMSTEC countries also agreed to establish seamless multi-modal transportation linkages and smooth, synchronised and simplified transit facilities through the development, expansion and modernisation of highways, railways, waterways, sea routes and airways in the region. They also decided to speed up efforts to conclude BIMSTEC Coastal Shipping Agreement and BIMSTEC Motor Vehicle Agreement as early as possible taking into account special circumstances and needs of the member states. BIMSTEC countries also decided for early conclusion of BIMSTEC Free Trade Area (FTA) negotiations, and directed the BIMSTEC Trade and Economic Ministerial Meeting and its subsidiary bodies, including Trade Negotiating Committee, to expedite finalisation of all related agreements of FTA as early as possible. BIMSTEC countries also called for exploring possibility of establishing BIMSTEC Development Fund with voluntary contributions from member states. The fund will be utilised for research and planning of BIMSTEC and financing of projects, and other activities of regional organisation. Work begins now on drafting a charter for BIMSTEC. A Permanent Working Committee will be set up to provide direction during the period between two summits and also to prepare the Rules of Procedure. The Secretariat has been promised additional financial and human resources and enhancement of its role to coordinate, monitor and facilitate the grouping’s activities. As the institution has been handicapped due to lack of financial muscle, the leaders took the bold decision to establish the BIMSTEC Development Fund. Recognising that 16 areas of cooperation represent too wide a spectrum, the BIMSTEC governments will make a serious endeavour to review, restructure and rationalise various sectors, identifying a few core areas. Fourteen years after signing the framework agreement on Free Trade Area (FTA), the leaders could only renew their “commitment to an early conclusion” of FTA negotiations. The Thai Prime Minister bravely urged participants to accept making BIMSTEC a Free Trade Zone by 2021 as “our common goal”, but this did not find a place in the summit declaration. The Myanmar President pointed out that the grouping had established its Energy Centre in 2009, but it was still struggling for the “early operationalisation” of the Centre. The 10th summit, framed its deliberations against U.S. President Donald Trump’s unconventional approach on world affairs, particularly the looming trade wars. BRICS leaders, stressed “the centrality of the rules-based, transparent, non-discriminatory, open and inclusive multilateral trading”, based on the World Trade Organisation. This stemmed from their broader commitment to cooperate for strengthening multilateralism, the rule of law and an equitable international order. That one of the BRICS members (China) does not follow in word and spirit this high-sounding prescription in regard to Asian affairs may have escaped attention. The other big idea emanating from the summit is to help nations to prepare for the Fourth Industrial Revolution. South Africa, as the host, stepped in on it and managed to create sufficient enthusiasm for it. Skill development as the digital revolution unfolds. The BRICS outreach to Africa began at the last summit hosted by South Africa, in 2013; it has picked up momentum now. But African leaders want more. They need big loans from the New Development Bank (NDB) for their infrastructure projects. So far, the NDB has dispersed loans totalling $5.1 billion — all to its members only. China introduced the “BRICS Plus” format at the Xiamen summit last year by inviting a few countries from different regions. South Africa emulated it, arranging the attendance of top-level representation of five nations of its choice: Argentina, Jamaica, Turkey, Indonesia and Egypt. As a partnership that represents over 40% of the world’s population and accounts for 22% of global GDP, BRICS will continue to be an influential voice as long as its convergences prevail over its divergences. Changing power equations within BRICS are being watched closely. China’s dominance is a reality even as the grouping asserts the sovereign equality of all members. Modi and his delegation were pro-active and visible. A South African commentator observed that India was playing “a delicate geopolitical game with the U.S., China and Russia as their spheres of influence wax and wane” across regions. To Delhi’s satisfaction, four paragraphs in the summit declaration were devoted to the problem of international terrorism. The India-South Africa partnership helped to ensure that the Johannesburg Declaration was balanced and well-rounded in its orientation. Slow pace of negotiations on services trade liberalization as opposed to ‘higher priority’ being accorded to commitments to open up goods trade in the region. While it was decided that negotiations on trade in goods, trade in services, investment and other areas will be conducted in parallel to ensure a comprehensive and balanced outcome. No much progress in issues such as Intellectual Property Rights and investment liberalization. India is relatively strong in services with its vast pool of professionals including from sectors such as Information Technology, as well as in activities such as installation, trouble shooting, training, maintenance, investment management. Issues raised by other members: easing norms on temporary movement of people could lead to immigration of professionals from India and in turn loss of jobs for locals. Union Government has constituted four-member Group of Ministers (GoM) headed by Union Minister of Commerce and Industry Suresh Prabhu to decide on 16-member Regional Comprehensive Economic Partnership (RCEP) negotiations. It was constituted to advise Prime Minister on whether to continue with or withdraw from RCEP negotiations. It has been mandated to find way forward from current deadlock over issues of joining RCEP or not. It will also help fine tune India’s strategy for the upcoming RCEP ministerial meet in August 2018 in Singapore. There has been rising pressure on India to allow more market access to RCEP member countries including China and conclude negotiations by end of 2018. Besides, India also has trade deficit with 10 RCEP countries including China, South Korea and Australia, among others. India’s financial assistance to SAARC neighbours declined considerably in the past five years. The one exception was the Maldives, to which Indian assistance has been consistently increasing year on year since 2013, despite the dip in bilateral ties. In Afghanistan, India has shifted to work on small development projects (SDPs) rather than the ambitious highways, dams and big building projects that were started in 2008-09. In Bangladesh, the main grant for land acquisition for the Akhaura-Agartala rail “last link” project has now been completed. In Bhutan, which has always received the largest share of Indian assistance, the assistance required for major hydroelectric power plants like Punatsanghchu 1 and 2 and Mangdechu has been disbursed 75-90% while Indian assistance to Bhutan’s 11th five-year plan (2013-2017) has been handed over nearly fully. In Sri Lanka, the decline was explained by delays in land acquisition for 15,000 homes to be built by India in the plantation areas, though the work on 45,000 homes in the north and east of the island has been completed. India is still completing three main projects in Maldives: a police academy, a coastal radar project, and the refit of MNDF ship Huravee. An offer to build a new Defence Ministry building is pending, which explains why the Maldives alone is the outlier to an otherwise declining trend in neighbourhood aid. Level of development in both the regional groupings are very different. Ever since it was launched in Dhaka with its first meeting in 1985, the platform has been hijacked by the India-Pakistan rivalry. It was a multilateral platform with a bilateral agenda. Prime Minister Narendra Modi offered to build a SAARC Satellite, a gift from India which would serve all the countries of the group. Pakistan was the only country that declined. Eventually, India decided to go ahead with the project and declared it as a South Asia satellite instead. Attempts were made to sign a treaty which would ease train and road transhipment among member nations in 2014. Pakistan opposed it and BBIN was signed instead. Pakistan anyways didn’t cooperated in SAARC. It only created obstacles. SAARC may become defunct altogether as BIMSTEC will become more relevant. Work done for decades in SAARC will become futile. India with its long history had problems with many of its South Asian neighbors. For any country to continue their journey towards growth contentious relations and hatred from neighbors will be a thorn in their progress and India is no exception. Maintaining peaceful relation with Pakistan is utmost important in-order to focus on development, otherwise India cannot fulfil its aspirations to be one of largest economies. Untapped economy of Pakistan can be a resource for trade and commerce. Shared porous border with Bhutan and Nepal are important for cultural ties, better economic integration, exchange of benefits like power, growing together peacefully. The ethnic ties is a parallel string of connection along with Palk strait with Sri Lanka, economic development of Tamil fishermen contribution to country, exchange of Buddhist cultural values will promote peace in India especially Southern State of Tamil Nadu which is important for country’s holistic development. Development of Afghanistan is in the interest of India for peace in the region from problems of terrorism and Afghanistan economy can be a better bet for Indian businesses to spread their presence. The island nation of Maldives with Indian diaspora is a contribution in itself and growing ties will encourage the trade, tourism of both. SAFTA, SAPTA and SATIS – These initiatives are aimed at regional economic integration in terms of goods and services trade. Hydro power generation and power trade agreement between member nations like Bhutan, Nepal and India. Proposal for a regional electricity grid. SAARC youth festivals and most important of all SAARC people’s meet. Declaration of 2016 year as SAARC year of cultural heritage and decade 2010-2020 as year of intraregional connectivity. Besides, SAARC countries are engaged in various bilateral and sub-regional agreements to make-up for lack of progress, if any, at the regional level. Bangladesh, Bhutan, India and Nepal (BBIN) formed a South Asian Growth Quadrangle aimed at boosting co-operation in energy and power, environment, trade and investment etc. This was later joined by Maldives and Sri Lanka. Diverse political culture- Different countries have varied political systems like democracy, military dictator ship, presidential and monarchy form of govt., creating hurdles in aligning the ideology. Indo -Pak conflict – Two of the biggest powers have fought 3 wars since 1947 and harbour utter distrust for each-other and even led to nuclearization of the region. Widespread socio-economic problems- hunger, terrorism, ethnic rivalries, political turmoil, leadership crisis. Negative List on Import items de incentives trade and its growth. SAARC countries would do well to build on their natural strengths and resolving issues mutually to help the region prosper for the betterment of their people. India is poised to become an economic powerhouse. This can’t be done in isolation from other economies. FTA is an avenue where India can achieve economic and trade integration with her partners. India currently has FTAs with ASEAN, Korea, Japan, Malaysia, Singapore, Sri Lanka and Thailand. FTAs can be formulated to mutually benefit partner countries by abolishing tariffs on movement of goods and services. Specific goods and services can be open for FTA and others might be kept out of its purview. 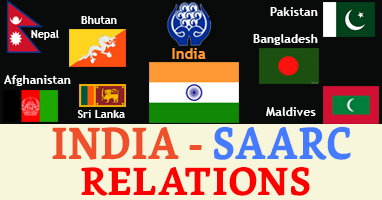 SAFTA is an FTA between all the South Asian countries. Though it’s a FTA it keeps essential commodities like agricultural produce, automobiles etc. out of its scope. Thus SAFTA is a weak FTA and hasn’t achieved economic integration at all. This is mostly due to India’s geographical and economic size which might be intimidating to non-exporting countries. A large negative list is maintained by countries like Pakistan to protect their domestic markets. As a result south Asia is one of the weakest economically integrated regions of the world. Over 40% of EU trade happens within EU while it is less than 5% for South Asia. SAFTA thus hasn’t affected India’s economy the way it could. But, it has enhanced the status of India of non-reciprocity in behaviour among neighbouring countries and has paved the way for better regional integration among SAARC nation. Further it has also provided boost to its Act East policy, since it paves way for increasing economic growth of North-east region. 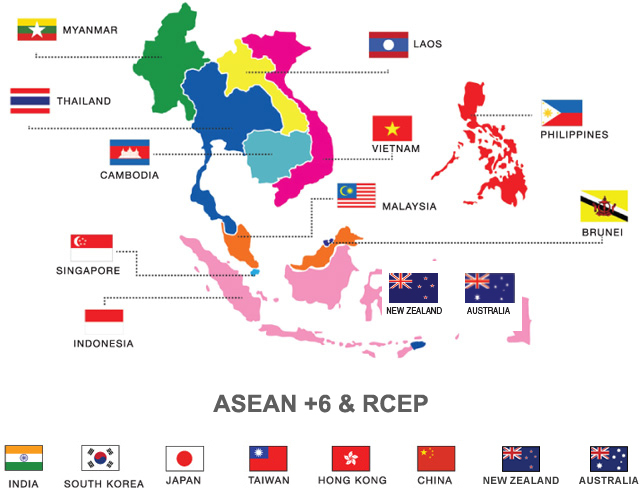 Negotiations on the RCEP have entered a decisive phase. Domestic issues may arise due to such alliance such as harm domestic manufacturing, leather industry etc. 15 Asia-Pacific nations including India fear that China may dump its excess capacity in several items including steel, as well as highly subsidised items which may harm local industry of importing countries and distort trade. What are the concerns that remain? The first is the greater access Chinese goods will have to the Indian market, a problem given India’s massive trade deficit. To circumvent this, given that India is the one country that doesn’t have an FTA with China, the government has proposed a “differential market access” strategy for China, which others are inclined to accept. After the Wuhan summit, India and China have made progress on addressing the trade deficit, with China increasing access for Indian goods such as pharma and agricultural products. The second concern is about demands by other RCEP countries for lower customs duties on a number of products and greater access to the market than India has been willing to provide. Some of the RCEP countries, including India, are headed for elections next year, a point where governments traditionally turn protectionist. Why India should not walk out of the RCEP talks? Despite these concerns, the Indian government must take into account the deeper strategic pitfalls of either slowing down India’s RCEP engagement or walking out of the talks at this stage. India must not take the easiest way out on the trade deal and walk out of talks. 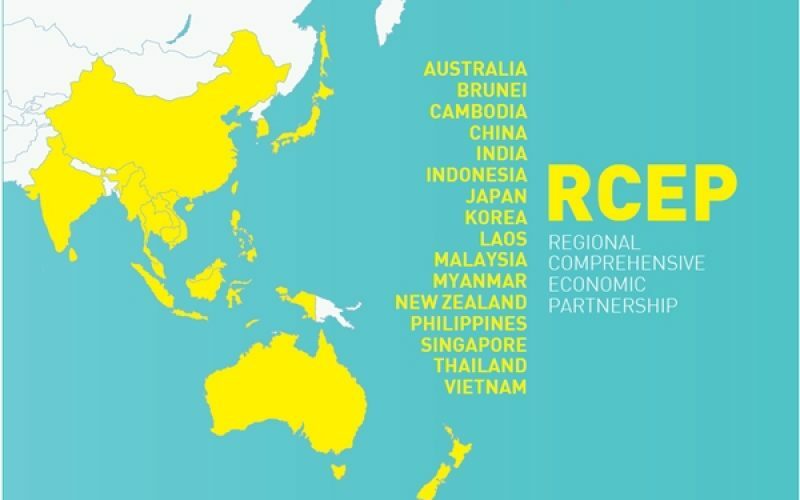 Walking out would cut India out of the rules-making process for the RCEP and give China further space in the regional trade and security architecture. At a time when the U.S. has broken from the global concord on multilateral trade agreements, an Indian walkout would endanger the united message that RCEP countries, which represent 40% of the global GDP, would wish to send out. The push for trade blocs has acquired a new urgency, with the Trump administration unleashing a trade war of sorts against China and even the EU. It would also be a sharp departure from India’s “Act East” slogan and its extended outreach to ASEAN. If the RCEP countries are keen on a slice of India’s market, they must sweeten the deal. CCIT is a draft proposed by India in 1996 that is yet to be adopted by the UNGA. Despite India’s efforts to push a global intergovernmental convention to tackle terrorism, the conclusion and ratification of the CCIT remains deadlocked, mainly due to opposition from three main blocs – the US, the Organization of Islamic Countries (OIC), and the Latin American countries. Universal definition of terrorism: no good terrorist or bad terrorist. Prosecution of all groups including cross border groups. Amending domestic laws to make cross-border terror an extraditable offence. US + allies: concerns over definition of terrorism, including acts by US soldiers in international interventions without UN mandate. There are also concerns that convention will be used to target Pakistan and restrict rights of self-determination groups in Palestine, Kashmir etc.